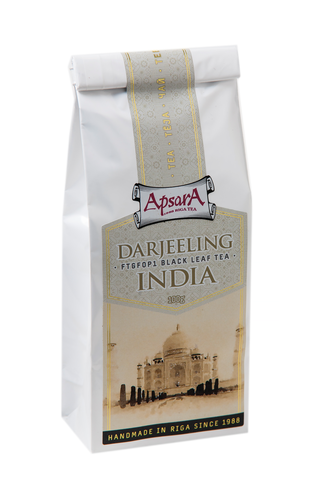 Ingredients: Indian black, high grown tea, Darjeeling region. Features&recomendation with food: High quality tea with medium strength and a unique sparkling muscatel alike aftertaste. Could be serves as an accompanying drink during receptions and presentations for important guests. Goes well with hard cheeses, dried meats, seafood. Harmonize taste and aroma bouquet with traditional Indian dishes such as "Rogan Josh." Product highligths>: Very famous tea region which produce four distinct harvests: Spring - (First Flush); Summer - (Second Flush); monsoon - (Monsoon) Autumn - (Autumn). In western countries, the US and Japan are highly evaluated only spring and summer harvest. Tea gardens total number - 88, are located in north India on foothills of Himalayan range. Average altitude of tea gardens varies from 610 to 2134 meters above sea level. Most tea are processed by so called Orthodox method and plucked only by hand.